We'd like to say a HUGE THANK YOU to the JIB Fund for their incredible $40,000 donation. 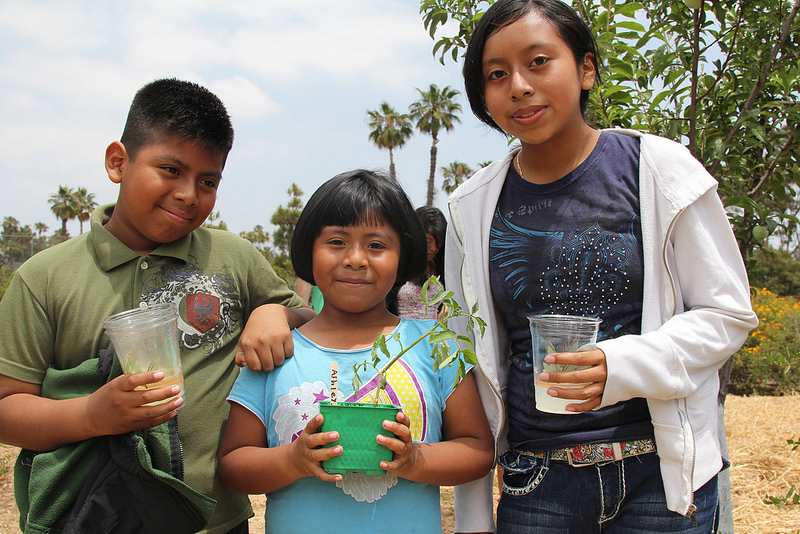 This donation will enable us to continue to expand our innovative and impactful programming in schools with gardens across Los Angeles, and disseminate best practices from our years of experience in garden-based education at the 24th Street School. This year's Fiesta was, arguably, even better than the last! We're thrilled to announce the opening of the greenhouse at Widney High School, next door to the 24th Street Elementary School. Did you know that the 24th St. Elementary School has more than one hidden gem on its campus? In addition to our Edible/Teaching Garden, we also have a Native Garden that contains plants and trees indigenous to Southern California like Oak and Cottonwood trees, native grapes, flowers and more. The Native Garden, which was created when the school ripped up much of the asphalt paving the playground, has become the focus of GSF’s recent efforts as we explore a new partnership with LA Audubon. Once we've smothered the tenacious weeds we can begin to plant more Native habitat plants for all of the incredible species that frequent the 24th Street gardens, from Ash-throated Fly-catchers to Kestrels and Cooper's Hawks. We plan to create new curriculum over the next year specifically around urban wildlife and what we can all do to create great habitats even in the middle of the city! This past month, in partnership with Big Sunday, a community service organization, we held yet another workday with the goal of cleaning up the Native Garden. During the workday, we removed some of the not-so-native weeds that had begun to penetrate the garden. 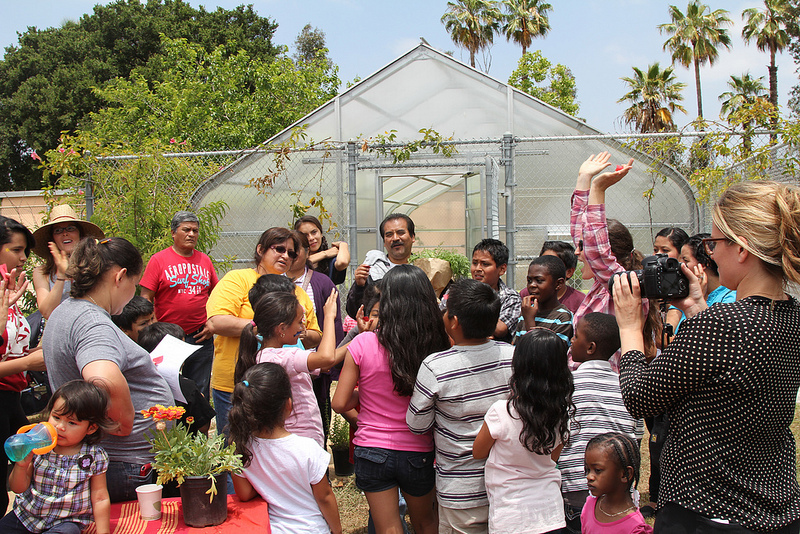 On June 9th, 2012, the Garden School Foundation will host its yearly Fiesta de la Huerta at the 24th Street Elementary and neighboring Widney High Schools. 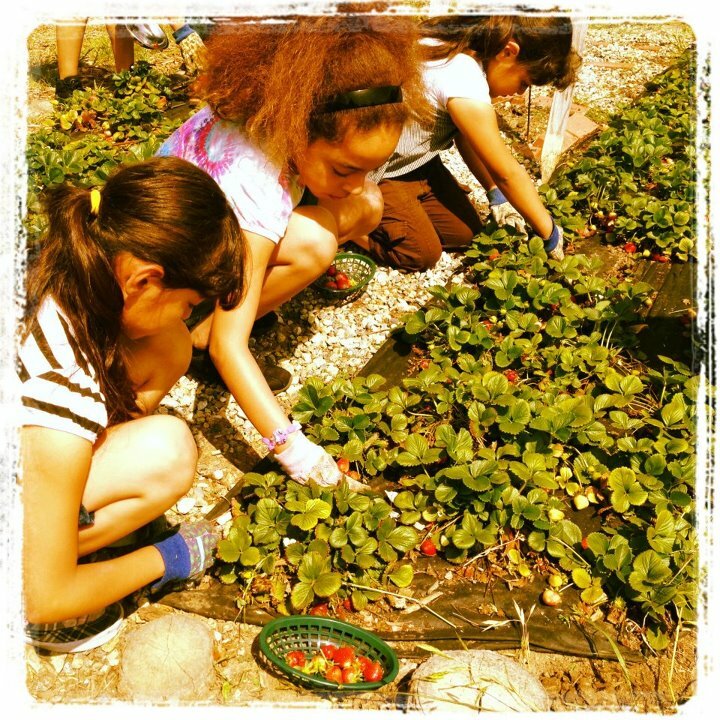 Set amid the ¾ acre kitchen garden and community orchard, the Fiesta brings together everyone that has participated in the GSF Seed to Table garden-based education program to celebrate a year of learning, planting, harvesting, cooking, experimenting, playing and connecting with the natural world. Fiesta-goers enjoy a morning of workshops with local chefs and non-profits, gardening games and activities, a mini farmer’s market harvest to home tutorial, cooking, scavenger hunts, yoga, dancing and entertainment provided by the incredible Pio Pico Middle School rock band. Special partners this year include Native Foods, Jolly Llama, Canelé Restaurant, Voices for Action, Whole Foods and Food Forward. The 2012 Fiesta marks a special moment for GSF as we announce our new Seed to Table curriculum, plans for additional school sites in 2013, and a new commercial greenhouse facility in partnership with Widney High School’s vocational horticulture program for students with developmental disabilities. 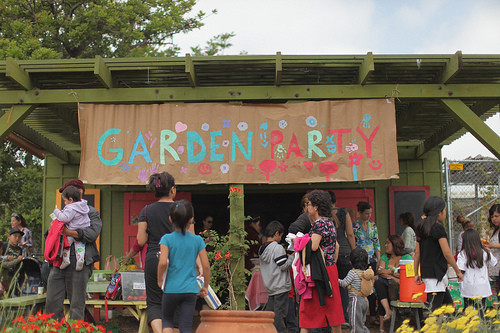 We invite anyone interested in the GSF program to join us for the Fiesta and spend a glorious morning with a wonderful and diverse group of folks who care deeply about the role of gardens in education and building community in under-served neighborhoods. Springtime at 24th Street School has been exciting. The garden is in full bloom and thriving, with bountiful blossoms of lush life in every bed and tree. While soft peaches, plump grapes and other desirable growths of the like are on their way to ripeness, so grow the undesirable: weeds. With the help of many volunteers during our Garden Work Days, we have been keeping the weeds at bay at the kitchen and native gardens with much sheet mulching, weed whacking and perseverance. As with beauty, they say that weeds are in the eye of the beholder. What exactly is a weed? Botanically speaking, a weed is “a valueless plant growing wild, especially one that grows on cultivated ground to the exclusion or injury of the desired crop.” Basically, a weed is any plant that grows where it is undesired. Weeds take up space while competing with crops and other valuable plants for nutrients, water and light. While invasive and unwanted, these wild whims of nature can be tamed and made useful. By smothering weeds with cardboard and mulch, a process called sheet mulching, we have cleared large areas of earth to plant new crops at the school garden. 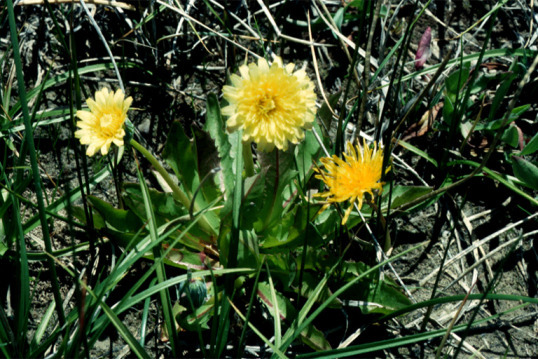 Common types of weeds found in southern California are: Bermuda grass, Dandelions, Crabgrass, California Burclover, Mallow, Wild barley and Whitestem Filaree, to name a few among the many. Come one, come all to the wonderful world without cars, pavement, or stop lights: 24th Elementary School Garden. Within our gates we offer a safe place for bugs, hugs… sorry but no slugs. Once a month the gates open to the community in efforts to help friendships blossom, the garden thrive, and the love for our environment grow. If you missed us on April 21st for our monthly workday, no worries, I’ll catch you up to speed now. In the early morning sun students, parents, community members, and volunteer groups eagerly made their way to the garden with shovels in hand. 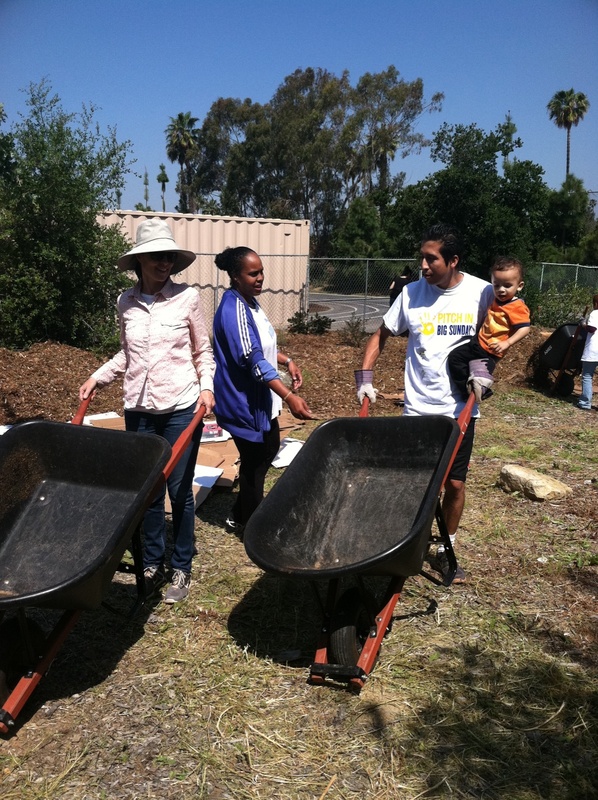 There is magic in people gathering from all areas of Los Angeles to work in a common mission: to help keep the garden beautiful and thriving for the kids at 24th Street Elementary. Throughout the day there was sweat, weed pulling, and probably little backaches, but never did the energy falter. One group worked fiercely to save the artichoke plants from being consumed by sweet pea plants, another group gave the wheelbarrows physical therapy, a group of students helped clean up the strawberries, and yet another group built muscle mulching the garden’s miniature orchard. Overall it was a very successful day in the garden! All of the day’s hard work was rewarded with a giant feast of the garden’s harvested carrots and strawberries, banana bread, fresh lemonade, hummus dips, and homemade Tamales! Everyone gathered to share their accomplishments, to learn from each other, and even share stories of their lives. The garden has a wonderful skill at bringing community together and slowing time down enough for us to smell the roses. Everyone left feeling a bit more connected to the garden, to Los Angeles and the people in it. 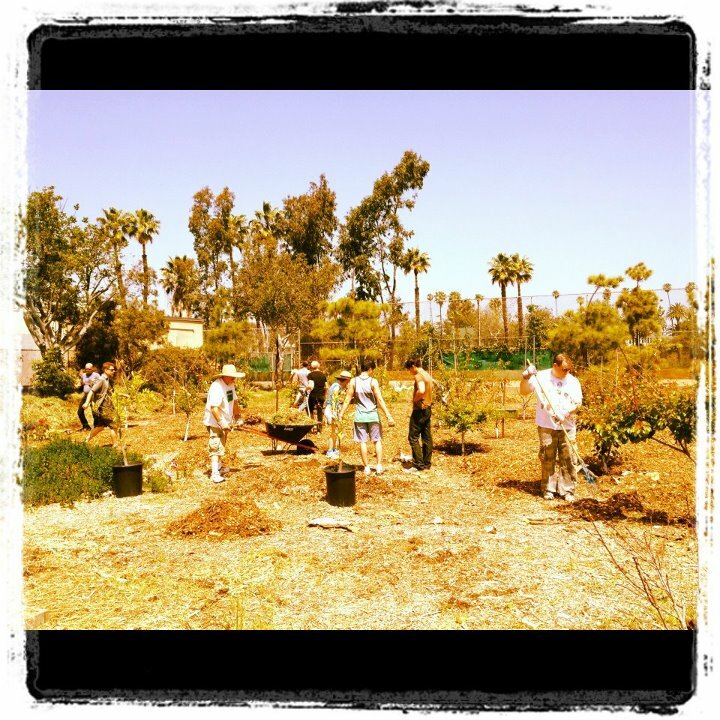 A big THANK YOU to all the people who joined us for our April Workday! Time Needed: However much you can give. Ingredients: Healthy soil, seeds, water, sun, wheelbarrows, hand tools, muscles, a positive attitude, and helping hands. Directions: Plant the seeds of today for the fruits of tomorrow. Then, add soil, water, and sun. Next, care for the seed, pull out invasive weeds, and reach out to companion plants. Finally, celebrate and repeat for the next generation of gardens! Composting: Our food turns into what? French in the Garden: Seriously! Harnessing the power of school gardens to transform lives!